So, This is the Miyabi, hopefully you all like her. My brother and his crew built the bike for me. He owns a small garage called Flying Piston Garage, located in Bandung, Indonesia. The garage builts bikes and hot roads. I bought the bike about a year ago and started building it right after it. Did some metal works for head lamp and front end covers. Rear and front wheels are both 21 inch. Seats will be leather covered soon. The Engine is totally overhauled. We went riding with the bike the last couple of weeks; No complain at all, handling and power are perfect. The process took about 4-5 months since their also have some customer bike to be built. All the body works and the frame were fabricated in the garage. The gas tank originally from DT model and we modified (enlarged) it so it fit the frame. Head lamp mask, front end cover, rear vender and pipe were also done in the garage. The engine was rebuilt by one of the garage crew. Front and rear wheels size are 21 inch. The handling is wonderfull and the power is great since I know since I rode it among a bigger engine size bike and I stil rode it convertably. Thanks to my brother and his crew (Flying Piston Garage), my Miyabi (XS 650), has completely done, only the paint but I’m still wondering if I am going to leave it just like this. EL YAWAZUKI…OG GARAGE BUILT COMING AT YOU!!! Excellent build! I like that most of the bike was built by you guys instead of bolt on parts! I love the old school look .” Very clean looking” .Like the cole foster low look to it. That´s some really nice scoot. I like what you did to the forks/headlight, 21 in the back is really cool also. And, by the way, really nice taillight. Love it, that kind of bike is right up my alley. out of the box old skool chopper…..,cool!! That rear wheel is massive and the headlight is goofy. I dig the tank and the exhaust though. I love this bike, great job on building her. In the second picture, I would LOVE TO SEE THE REAR SUSPENSION UP CLOSE. THAT IS BANGIN’ COOL !!!!! Good photography, too. Lots of interesting things to look at in the background. Congratulations again. andi… love how this bike is slammed… what’s your ground clearance? …or what drop does the frame incorportate? @Fanoboss: You mean the fornt suspension cover and the head lamp mask? @Ryang: around 10 cm so it’s about 4 inch. @Andi, yes the front forks and headlight would be a great seller here in the US. It’s very similar to Harley cruiser bikes. Nice. Man, I’m tellin’ ya. You guys have got to do a feature on Indonesia cuz those dudes are killin’ it! Love the headlight cowl and the single down tube frame. Killin’ it. DITTO WHAT I_am_10_ninjas SAID. These guys have a unique style/flavor that is all COOL !!!!!!!! I really like the look of the rear wheel. Good job. 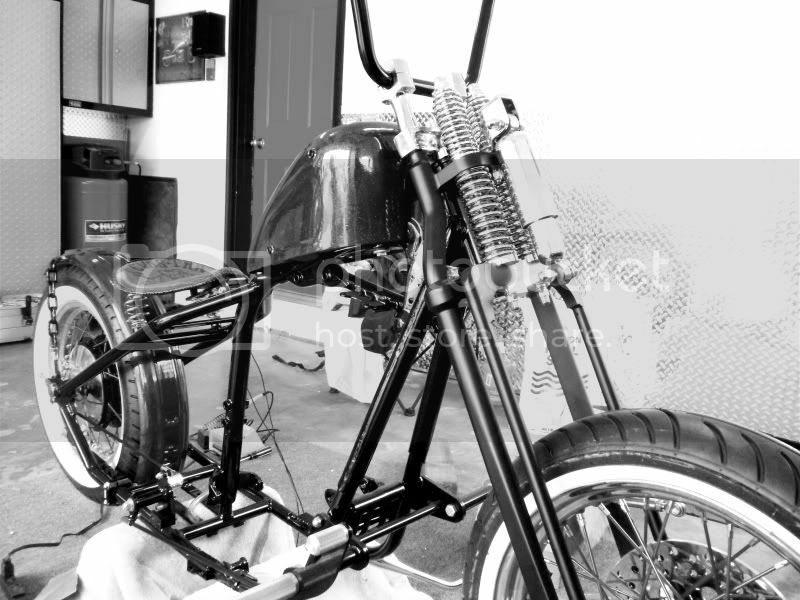 Cool bike, nice bits and pieces….Whats the stretch on that hardtail? Love the raw, old school look and loving the 21’s front ta back!! Seksi Banget bro. Knalpotnya keren juga! Thanks heaps for posting…inspiring. daripadariweuhnyakbrur.. mending ber-XS ria .. ber-XaryaSeni.. !! https://www.xs650chopper.com >> emang bikin drooL ! !